Cady Noland creates incisive works that challenge the American dream, suggesting that the ideal of upward mobility through hard work begets a culture of resentment in the face of celebrity culture and corporate influence on government. Many of her sculptures question the nature and origins of violence, power, and control and explore the ways in which fear can steer democracy. The construction of masculinity is one of the many topics that have served as subject matter for Noland's work. 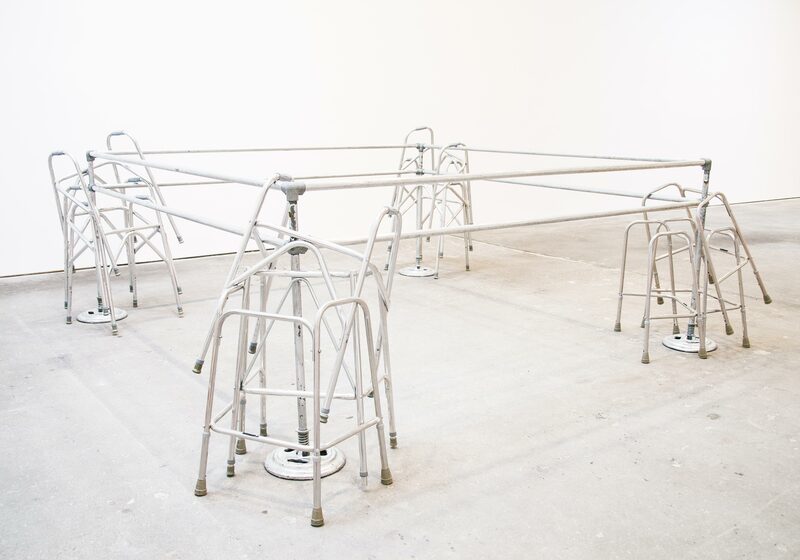 Frame Device resembles a boxing ring and suggests a site for controlled violence as sanctioned entertainment with the potential for impaired mobility. Noland's work resonates with social commentary, humor, and deeply held skepticism. "Frame Device." Take It or Leave It: Institution, Image, Ideology Digital Archive. Los Angeles: Hammer Museum, 2017. https://​hammer.ucla.edu/​take-it-or-leave-it/​art/​frame-device/​.